This year Bangor Science Festival is trying something a little different and will be partnering with the Festival of Discovery which is being held at the Mona Show Ground on Anglesey between the 30th May and 1st June (Thursday, Friday and Saturday). We will be bringing science to the masses at what promises to be an exciting event full of all sorts of exciting activities, and will be a first for Anglesey. We will not be holding the Hidden Worlds public event in Brambell this year during British Science Week. 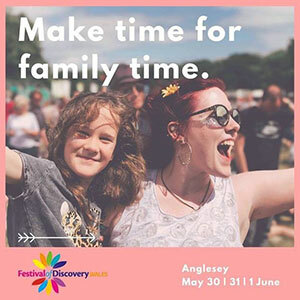 At the Festival of discovery visitors will discover Bush Craft, Storytelling, interactive Science, Future Foods, Cookery, Country Pursuits, Music, Dance and Theatre. There will be something on every hour over the 3 day festival, with a jam packed programme of family fun and experiences. We would love to see our loyal science festival followers there. As an official partner, Bangor University has been allocated complimentary children’s tickets and half-price tickets for adults. The tickets will be available through the Bangor Science Festival Web site from the 1st March – 31st May. There is also camping available on site! Get involved and share your views with us! Like our facebook page to see up to the minute news and information. You can look forward to all this, and much more, at this year’s Bangor Science Festival.